While it may seem unthinkable, children all across the United States are increasingly vulnerable to mental illness and subsequent suicide. A country where anything is supposed to be possible and anyone is supposed to be able to be whomever they want is paradoxically filled with youth who feel alienated, abused, and marginalized on a daily basis. The Centers for Disease Control and Prevention (CDC) reports that suicide was the second-leading cause of death among Americans aged ten to thirty-four in 2016 and the ninth-leading cause of death overall that year. Suicide deaths routinely exceed homicide deaths by nearly double, and the problem is particularly urgent for Americans under the age of eighteen. 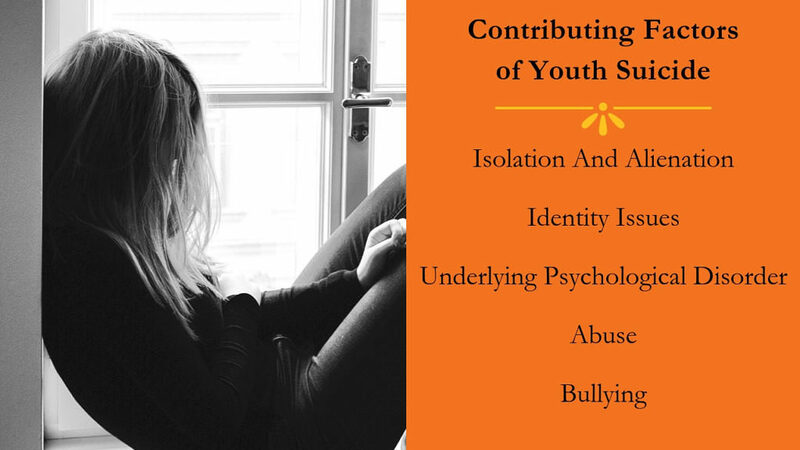 As the figures most involved with this at-risk population, parents and educators of vulnerable youth are specifically empowered (and compelled) to address factors that lead to and sustain suicidal thoughts and ideations. You can help keep your child or student protected from suicide through relatively simple and everyday levels of intervention. Data from the National Institutes of Mental Health (NIMH) indicates that 1 in 100,000 children aged ten to fourteen take their own lives each year. The CDC reports that youth suicide is an especially severe problem among young girls in that same age range, as well as being a problem for females in every age group: the CDC reports that suicide rates among females fifteen to nineteen have doubled in the past three years. One of the keys to preventing youth suicide is identifying and addressing the common factors that contribute to this tragic and alarming trend. Each day children confront a range of problems for which they don’t feel there’s anywhere they can turn. It’s a common trope that children don’t think the world understands them, and yet there is also a great deal of validity to this feeling, causing more and more children to contemplate taking their own lives. Parents and educators should always take their children and students seriously when they voice concerns about things such as feeling lost, not being taken seriously, or feeling a sense of hopelessness. The feelings described above often accompany depression, anxiety, or another legitimate and diagnosable psychiatric disorder. Data from the National Institutes of Health (NIH) indicates that about 90 percent of suicides are the direct result of mental illness, and children are no different. Severe negative feelings may often be exacerbated by conditions like bipolar disorder, severe anxiety disorder, or co-occurring drug or alcohol use. Identity plays a more important role than ever in children’s lives. Whether it’s sexual orientation, race, gender, economic status, cultural background, or any other identifiers, kids are feeling the weight of these issues at a younger and younger age. The CDC reports that LGBT youth contemplate suicide three times as often as heterosexual teens, and a recent study published in JAMA Psychiatry reveals that suicide rates for black children are twice those of white children. Whether it’s of a physical, emotional or sexual nature, children who experience abuse are at an increased risk for both completed and attempted suicide. In one study published by the National Institutes of Health (NIH), 80 percent of respondents who experienced suicidal thoughts had a history of child abuse. Some child abuse victims take their own lives when they’re still children, and some succumb to the trauma they experienced as they become adults. Family history of depression or suicide. Lack of a support network. Poor relationships with parents or peers. Despite significant reforms and national grassroots efforts, bullying is a problem that continues to plague children all across the country and is one of leading causes of childhood suicide attempts and suicidal thoughts. more than three million children are bullied at school each year. 25 percent of teachers see nothing wrong with bullying and rarely intervene. nearly 20 percent of children are bullied multiple times per month. The CDC reports that bullying and suicide are closely related, and multiple data indicates that bullying victims are two to nine times more likely to commit suicide than are nonvictims. One UK study revealed that half of all suicides in the country are related to bullying. The trauma that comes from bullying can and often does occur in a particularly vulnerable time in a child’s development, heightening the risk of self-harm and suicidal thoughts. Bullying victims routinely internalize the incessant abuse and endeavor to take their own lives as a means of escape because they can’t see things ever getting better. As bullying is so closely related to childhood suicide and is increasingly prevalent on and off school grounds, it’s critical that parents, educators, and all other adults understand the warning signs and intervene when appropriate. Frequent and unexplained bruising, scarring, and other physical injury. Frequently lost or missing money or property. Damaged clothes or other types of property. Sudden increased attachment to adults. Fear of riding the school bus. Frequent visits to the school nurse’s office. Complaints of physical symptoms such as headaches or stomachaches. Decline in confidence and self-esteem. Increased thoughts and comments about suicide. Bullying others, such as smaller peers or younger siblings. Changes in friends and social circle. If your child or student is experiencing these or other suspicious symptoms, it’s important to identify the root of the problem. Unfortunately, however, many children fail to report bullying out of fear or embarrassment, and the behavior is allowed to continue. Very often, parents and educators must employ other means of investigation when determining if their child or student is being bullied. This may require talking to educators and taking a closer look at their social lives. The term cry for help is often used when describing less-than-genuine suicide attempts; these cries should always be heeded rather than met with skepticism because it’s impossible to know how sincere your child may be without paying the ultimate price. Oftentimes, however, it can be extremely difficult to identify suicidal ideations and inclinations in children, as many often hide their intentions until they attempt to follow through. Parents and educators must be diligent in identifying the signs. Depressed or anxious social media posts. Threatening or talking about suicide. Expressing feelings of shame or worthlessness. Texting friends cryptic or frantic messages. Avoiding friends and loved ones. Some older children will even go so far as to make out a last will and testament, prepare a note and start saying thinly veiled goodbyes to their friends. Data from CDC and reported by the Children’s Hospital of California (CHOC) reveals that over 25 percent of high school students felt sad or hopeless every day for at least two weeks, and 16 percent had seriously considered attempting suicide in the past year. Nearly 13 percent reported creating a plan for suicide, and 8 percent said they had tried to take their own lives within the previous year. The CDC also reports that over half of all people who committed suicide did not have a known or diagnosed mental health condition. 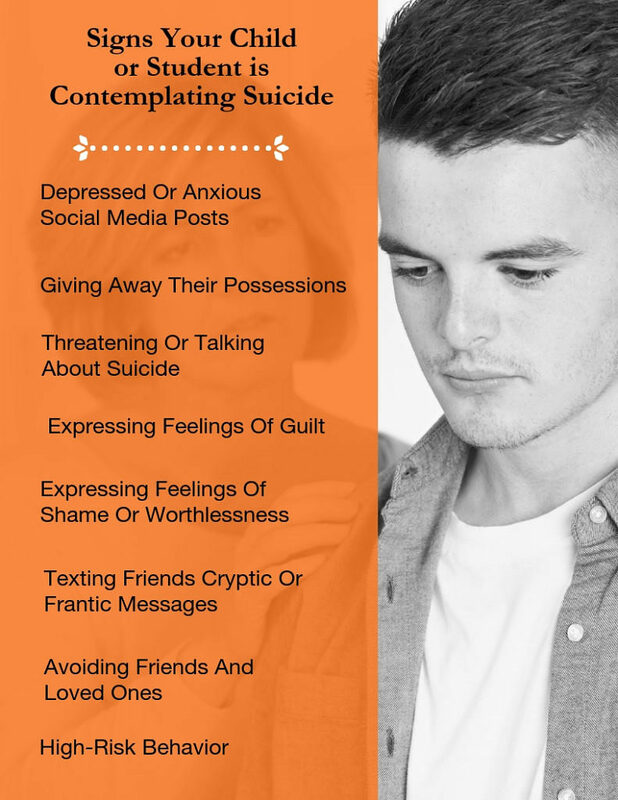 It can be incredibly jarring to learn that your child or student is contemplating suicide or is going through a level of pain and emotional distress that can cause them to consider taking their own life. The revelation can leave adults powerless and at a loss regarding what to do, particularly parents who are not formally trained or experienced in child psychology. If you suspect your child or student is contemplating suicide, you’re not alone and you’re not powerless. There are an abundance of resources, including those from the CDC, the Substance Abuse and Mental Health Services Administration (SAMHSA), the National Alliance on Mental Illness (NAMI), and others to help you take steps to save your child’s life and address their underlying mental health issues. Talk to them. A little involvement goes a long way. Many times, children just want to know that there’s an adult who understands their struggles and that there’s a light at the end of the tunnel. Talk to your child directly about their emotional state. If you’re an educator who suspects your student may be suicidal, get the parents involved. Ask the child simple and nonjudgmental questions and avoid confrontational or irritated tones. Don’t be afraid to talk about suicide. Talk to their friends. It’s no mystery that children, particularly teenagers, often confide in their friends more than their parents. 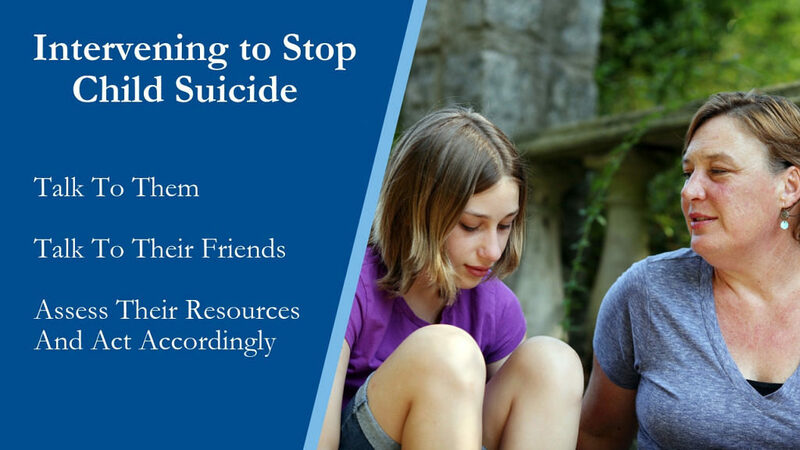 If you suspect that your child or student may be suicidal, one of the quickest ways to determine their level of risk may be talking to the people with whom they spend the most time. Find out if they’ve made any alarming comments or sent or posted any concerning texts or social media posts, and find out if they’ve discussed details as to how they plan to carry out their suicide. Assess their resources and act accordingly. If you determine that there may be a real concern of suicide, do everything you can to limit their potential to carry out the plan. This may include keeping them home more, removing potentially dangerous objects from their possession, and making other appropriate environmental changes. Once you discover your child is vulnerable to suicide, you should consult a counselor, child psychologist, or other trained mental health professional and get the young person into treatment immediately. If you are concerned that your child or student is contemplating suicide and are at a true loss regarding what to do, call the National Suicide Prevention Lifeline: 1-800-273-TALK (8255). They have trained counselors available 24/7 to speak with either you or your loved one. If your child has already attempted suicide and was unsuccessful, psychiatric treatment and long-term suicide watch may by imperative to preserving their lives. The Society for the Prevention of Teen Suicide has comprehensive information regarding what to do once your child is discharged from the hospital after a suicide attempt. Some children who are considering suicide may require higher levels of behavioral care than others, including targeted and in-depth psychological counseling to address the root causes of their feelings, and ways to move past their inclinations. Some mental health professionals may recommend medication for eligible children; however, this is a decision every parent must make for themselves and for their child. Long-term counseling is highly advisable, as are regular assessments of a patient’s progress. Oftentimes, these suicidal inclinations are the product of neurochemistry that goes deeper than external factors like loneliness or bullying. These particular situations must be addressed by an experienced and qualified mental health expert. It’s perfectly natural to be initially unsure of what to do when you find out your child or student is contemplating suicide. Even the most experienced and trained child behavior experts are often thrown by these revelations in their own children. It’s important to realize, however, that this is a time-sensitive matter that requires swift and decisive action. Emotional paralysis as a result of guilt or confusion does nothing to save your child or student’s life. If they ever needed an adult to step in and take an interest, it’s at that time. While your child or student’s suicidal thoughts may not be your fault, the moment you find out or suspect they’re emotionally vulnerable, they’re officially your problem. Get them the help they need. usatoday.com – Teen suicide is soaring. Do spotty mental health and addiction treatment share blame?